Ravens play an important part in the upcoming animated adventure 'Search Dog's Raven'. We tried various strategies to film wild ravens, including attracting one to a bird feeder. 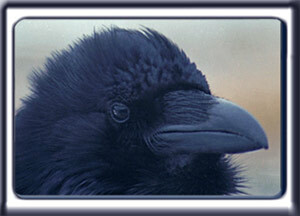 It also helps to live near the mountains, or other areas where ravens are spotted year round. By offering chicken liver, we were finally able to attract a raven to our bird feeder. We also put some cheap crystals and plastic mirrors around the trough feeder to glint sun light. Magpies and then crows came first, along with sparrows, robins and some chickadees. Then several months later a raven started visiting the feeder. The large black bird was particularly curious about the crystals.